On Monday, December 3, 2018, Joan Sinift, devoted and loving mother, grandmother and great-grandmother passed away peacefully at the age of 90. Joan was born on May 11, 1928 in Toledo, Ohio to Lloyd and Veronica Rogers. She retired from Raymer Elementary in Toledo Public schools in 1990 as a lunch lady. She was a long standing member of the Altar Rosary Society from Good Shepherd Parish, serving as President at one time. She was a lifelong member of Good Shepherd Parish until its closing in 2015. On October 7, 1950, she married Donald R. Sinift. They were married 60 years until his passing in 2011. They raised 2 sons, Russell and Robert and three daughters, Diane, Barbara and Mary. Joan will be remembered for her unwavering faith, loyalty and love for her family. She could often be found gardening in her yard, tending to campfires and loved fireworks. 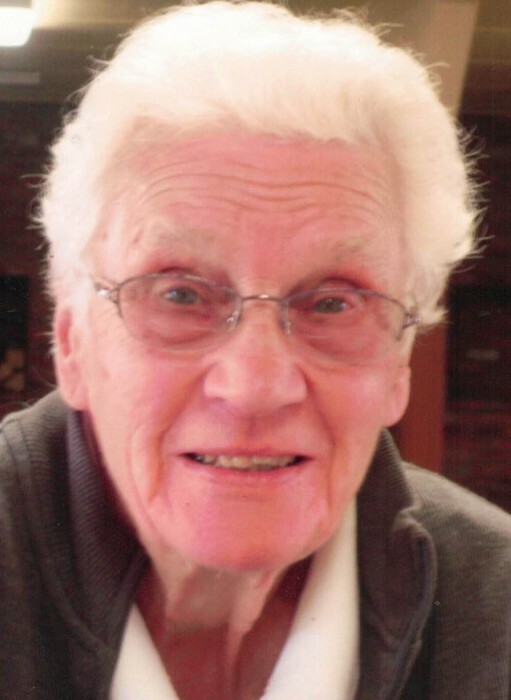 She was a self-proclaimed tom-boy and loved sports. She was a lifelong fan of the Detroit Lions & Tigers, as well as the Ohio State Buckeyes. She could always be found cheering in the fan section of any grandchild or great-grandchild’s sporting events. She enjoyed going on vacations with her family to Florida, Texas, and San Diego. She could often be found cooking for her family or making them a snack if they stopped by. She loved going to the Eastwood Movie Theatre as a child and spent many days watching movies there, she continued to go there her entire life. Of all her passions, family gatherings brought her the most joy. She loved being with her children, grandchildren and great-grandchildren. She was an ever present staple in their lives and attended all important events. Joan was preceded in death by her husband, Don, her brother, Ronald Rogers and her granddaughter, Joan Angel. She is survived by her children, Diane (Wayne) Burdge, Russell (Terri Lewandowski), Robert (Donna), Barbara (Larry) Angel and Mary Keefe, 16 grandchildren and 16 great-grandchildren. Family and friends may visit the Freck Funeral Chapel, 1155 S. Wynn Rd in Oregon on Monday, December 10, 2018, from 2-8 p.m. with the Rosary to be recited at 7 p.m. The Funeral Mass will be held at 11 a.m. on Tuesday at Epiphany of the Lord- St. Thomas Aquinas Church, 729 White St., Toledo, OH with the family to receive guests after 10 a.m. Burial will follow at Lake Township Cemetery. Memorial contributions can be made to the Alzheimer's Association or any Veteran's Association.